﻿Feeling rushed for time? I have some favorite go-to recipes and this is one of them. Today for lunch I needed something quick and easy. My own children love this recipe and so do most of the daycare children. Perhaps you can try this on your brood when you're in a hurry. 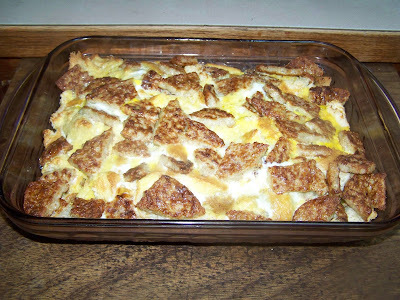 It also makes a fast hot dinner or nice weekend brunch casserole. To make this tasty main dish, you'll only need bread (any type, even croutons would work), eggs (about a dozen), meat of some sort (we love sausage or ham, but bacon would be great too! ), and cheese if you have it. Tear up enough bread (I used a mixture of homemade croutons and sandwich bread today - but any bread will do) to make an even layer in a buttered 9 x 13 inch pan. It doesn't have to be perfect, in fact the more uneven the pieces are, the more rustic I think the dish looks. Layer 1/2 to 1 lb of cooked ham, bacon or sausage. Today I used sage breakfast sausage patties and just broke them into pieces. Layer shredded cheese if you have it. I didn't have any cheese today. Scramble a dozen eggs and season to your liking. Pour eggs over bread, meat and cheese. Let the bread absorb the egg mixture for a few moments prior to baking. Bake covered in a 350 degree F. oven for approximately 30 mins. Remove cover and bake uncovered for another 10 minutes or until eggs are set. If the mixture appears liquidy when you jiggle the pan, it needs to cook longer. Serve with sliced tomatoes and condiments of your liking. I really love salsa or tabasco sauce. Enjoy! Yummy! Thanks for stopping by my blog! Nice to "meet" you! Great blog, love your sharing on gardening! Will be sure to stop by again! Thanks Cubarado! I appreciate you stopping in as well! Looking forward to your future postings! Have a great day! Thank you for stopping by with your daughter to visit my blog...I am so glad you enjoyed my doll work...I also have a website featuring my work if you would like to see more. Kelsi, thanks so much for saying Hi! I will check out your website! What an artist you are! Thanks Lavender Dreamer! It's simple too which makes it a favorite around here! Thanks so much for taking the time to stop by! Hopefully I'll have some useful and interesting things on my blog but I'm nothing as beautiful as your art! Have a wonderful weekend!